Sometimes some great value wines come along that completely blow me away. Without question, these little beauties certainly offered great flavour, quality, but most importantly value. Great little wines that are selling well, and liked so much, that these are being poured for a staff’s relatives wedding. A region that is technically part of the Rhone Valley, the Luberon is located between the Southern Rhone and Provence between the Durance river to the south and the Calavon River to the north, with most vineyards located between 150-450 metres. This creates a great diurnal range (a drastic change in temperature from day to night) that results in a slower maturing of the grapes. The heat to assist in the ripening process during the day, yet keeping the acidity high during the cool of the night. The end result? Wines that are fruit driven, easy drinking and quaffable! And when we speak of French wines, the word terroir is always a factor: not only the climate and sunshine I just mentioned, but the soils being a huge contributing and important factor in the production of any French wine. It’s no different in the Luberon with varying soils of clay, gravel and sand along with a large percentage of limestone mixed in! Clay soils usually give more full bodied, structured wines, whereas sand tends to create wines that are lighter with more fresh fruit aromatics. Throw in some limestone to give those minerality tones in the wine! For me, it all creates some serious yumminess, especially for the Marrenon Triplet wines! Marrenon Les Grains Chardonnay – an unoaked style that is a delicate light lemon colour with tropical fruits of pineapple, mango and other exotic fruits with a good deal of citrus and mouth watering acidity on the palate. Finishes strong and clean, this is a great wine to use as an aperitif or any lighter fish dishes. 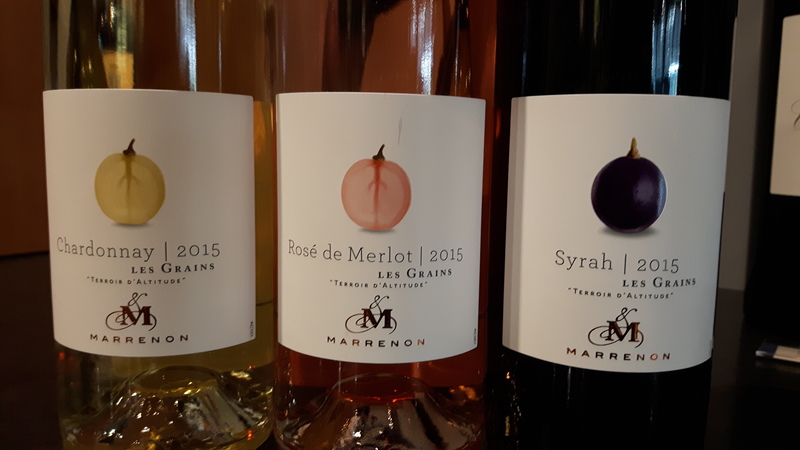 Marrenon Les Grains Rosé de Merlot – those who know me, know I’m quite fond of rosé, and while we mostly see rosé from this area made from the usual suspects of Syrah, Grenache and Cinsault, this is made from 100% Merlot. So pretty with floral notes of honeysuckle, peony and rose on the nose, the palate is full of raspberries, sweet cherries and strawberries. So delicious on its own or with a Provençal salad. Marrenon Les Grains Syrah– made from 100% Syrah in a fresher style, this does not have the typical “peppery” aromas and flavours like those of a Côte-Rotie or a St. Joseph from the northern Rhone. Instead, it’s very fruit forward with black fruit aromas of blackberry and black cherry along with violets and soft spices. Deep and brooding, the colour stains the glass! Smooth tannins that balance with the high acidity, leading to a nice finish. Try with any barbecued meats such as pork kebabs, or beef tenderloin. The best part of these wines? All this flavour and yum for under 20 bucks…all three priced at $17.95/bottle! Santé! This entry was posted in Tasting, Varietals, wine and tagged Chardonnay, climate, France, Luberon, mediterranean, Merlot, Provence, Rhone Valley, Rose, soil, Syrah, terroir. Bookmark the permalink.